The ‘Soviet Soldier’ – a monument commemorating the collective sacrifice of the Soviet army against Nazi forces – has been toppled in western Ukraine. This follows the country-wide fall of some two dozen Lenin statues. The taking down of the ‘Soviet Soldier’ in the town of Stryi, Lvov region, turns a new page in the chaos that gripped the nation in November, and has taken on dangerously nationalist overtones in the past fortnight. The city administration’s website first reported on the story of the monument, erected in 1965 as a companion piece to two other objects: an obelisk with WWII engravings and the Eternal Flame over the tomb of the Unknown Soldier. No official confirmation of any orders for its removal has been given. 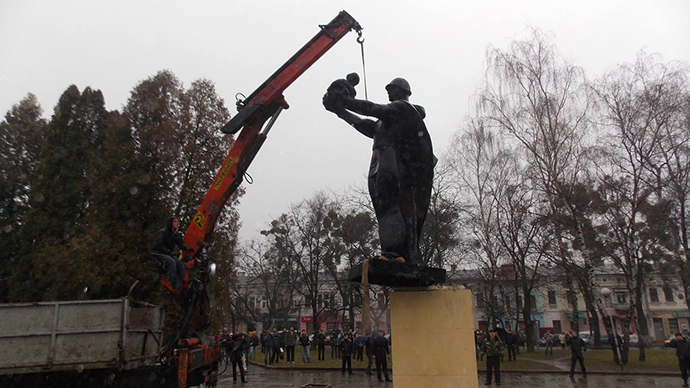 The incident follows the dismantling of some 25 statues of Vladimir Lenin, the leader of the 1917 revolution that paved way to the creation of the USSR. One of the latest in a string of such incidents, in Dnepropetrovsk, saw people using ropes and a saw, before jumping onto the statue – the way people did in Iraq when Saddam Hussein lost power. The writing on the monument was then taken apart letter by letter, which the rioters kept as souvenirs. After the statue was toppled, the City Council declared Lenin Square in Dnepropetrovsk was renamed into Heroes of Maidan Square. As the fallen statues were being counted, on Sunday the Ukrainian Rada decided to strip Russian of its status in the Ukraine; a fate that will befall other regional languages as well. With Russian, however, the figures are quite clear: the latest census of 2001 showed that nearly 30 percent of Ukraine considers Russian to be its mother tongue – nearly 15 percent of them are Ukrainians. Although the language has never had official status, it was given regional status in 2012 in the south-east of the country. The repealed law on regional language usage was President Yanukovich’s campaigning ace, as he sought to combat the notion created by former President Viktor Yushchenko – that Ukrainian should dominate over all areas and spheres of life. 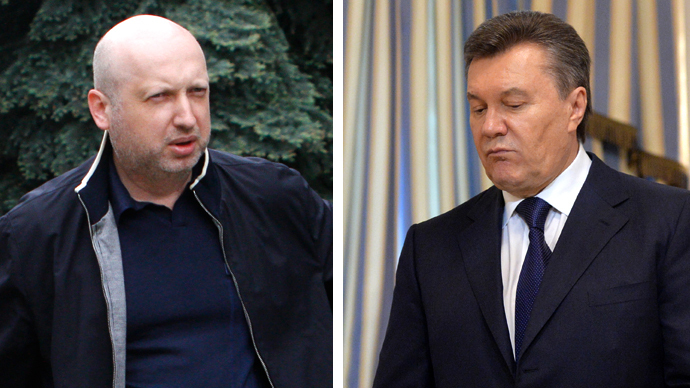 Speaking recently to Kharkov’s UBR TV channel, President Viktor Yanukovich aired his grievances about government. "Everything that is happening today is, to a greater degree, about vandalism, bandits and a coup d'etat," Yanukovich said. The president went on to dub the events as the country’s worst political crisis in modern history and compared it to the rise of the Nazi ideology in the 1930s. Although Kiev’s Independence Square, and the country as a whole, could be seen containing a number of different groups and opinions at the start of the mass riots, the so-called Right Sector has by many accounts begun to play a more prominent role in the uprising. Reports from the ground indicate that this segment of the opposition is a loose conglomeration made up of the remnants of post-war Nazi-collaborators – the Organization of Ukrainian Nationalists, as well as various football hooligans and smaller nationalist gangs.